When it comes to quality, compassionate care, no one beats the office staff of Dr. Jeff J. Mollins. They say that your’re only as good as the people who represent you. That is especially true when it comes to the office staff of Dr. Mollins. 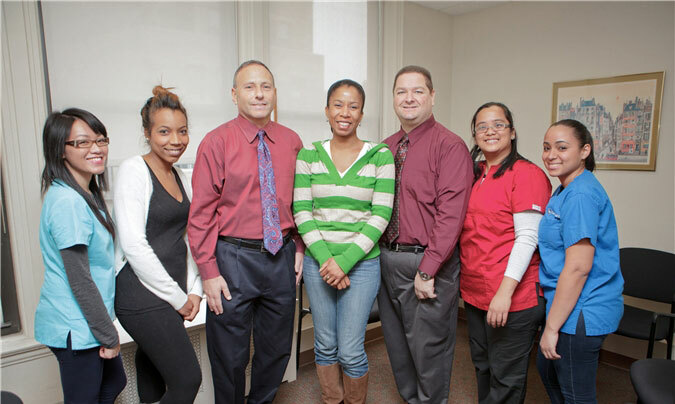 Dr. Jeff J. Mollins has been providing care to injured workers for over 25 years in Downtown Brooklyn and has been blessed to have a terrific office staff. Many of Dr. Mollins’ employees have been working with him for over ten years and are the “best in the business”. When you enter our office you will be greeted by the beautiful smiles of our front desk receptionists. They are extremely knowledgeable and will assist you in any way possible to make your visit pleasant. The front desk ladies understand that you may be in pain and possibly going through difficult times. They are very caring and empathetic to every individual patient. If you require a letter, use of our phone, fax, etc., it will immediately be provided for you. As you travel to the rear of our office for treatment, we have extremely skilled chiropractic assistants who will bring you to your room and immediately put you at ease. The chiropractic assistants work hand in hand with Dr. Mollins to provide all our patients with quality care. (C-4’s, variances, etc). Fortunately, Dr. Mollins has a separate team of staff members that work exclusively on proper documentation and billing. These group of individuals are skilled, highly qualified and knowledgeable of the latest updates on workers compensation. They regularly attend seminars to keep them on the “cutting edge”. Our staff will make sure that all paper work is submitted properly and in a timely manner, so our patients will receive compensation benefits as soon as possible. Dr. Mollins considers his office to be a big family. With our courteous, compassionate, professional office staff, we are sure your experience with us will be extremely positive. Dr. Mollins is a Diplomat of the National Board of Chiropractic Examiners. He is certified in physiotheraphy, theoretical and clinical laboratory diagnosis, x-ray and spinography, as well as dissection of the human body. He is also a Medicare provider (X19311), and certified by the State of New York to provide both treatment and peer review for injured workers by the NYS Workers Compensation Board (CO3541-2). Dr. Seligman specializes in the treatment of patients that have been injured at work. Dr. Bob is an expert with the multitude of specific paperwork that needs to be filed on behalf of the patients in order for them to be authorized for treatment, x-rays, MRI’s, and all diagnostic tests that may need to be performed.